The holidays are right around the corner and on our eternal wish list is that we be more intentional with how we stuff our stockings, with how we spend our time, and how we choose our gifts. We at HandMADE Montana believe that the holiday MADE fair is a good place to start. HandMADE Montana is an organization for artisans and makers. We are happy to present a modern craft fair in Western Montana and are grateful to have been met with such enthusiasm, warmth and desire for more. When we think about a sustainable future for our community, we think first about connection. The small connections that happen in our day-to-day lives and the bigger connections that interact more broadly with our environment and in our greater social conscious. In our day-to-day lives, we are on our phones and (especially this time of year) we are scrolling through Amazon wish lists or tumbling down the rabbit hole of Pinterest trying to find that perfect gift. 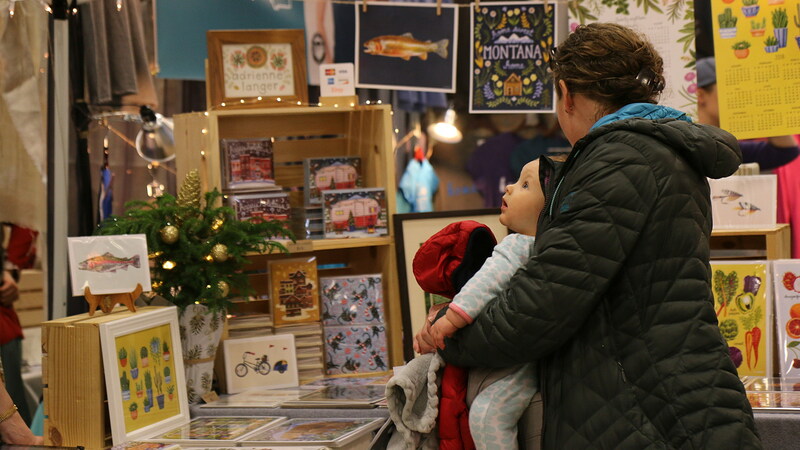 We know we spend too much time interfacing with screens, so let’s start by making the small connections: Visit one of your community’s many handmade markets like the Missoula Holiday MADE Fair. Remember what it feels like to pick up objects and hold them to the light, to run your hands through clothing racks, to run into friends, to find the perfect gift you didn’t even know you were seeking. We all want to see less waste, smaller ecological footprints, less toxic materials—the list goes on. We’ve seen the slow food and farm to fork movement and we’ve seen them work—now let’s get on board with the handmade revolution. We wouldn’t be living in Montana if we weren’t struck again and again by the beauty of the landscape; we wouldn’t be living here if we didn’t want to invest in its future. Shopping small and handmade pays it forward to the environment—by opting out of online and big box retailers, you’re helping to reduce carbon emissions from freight shipping and helping to reduce pollution and hazardous waste generated from factory production. When you buy local you are generating wealth for the local economy. You are investing in the future of our community’s artists and supporting your neighbors and friends. Every dollar you choose to spend with an artisan or small, locally owned business has a larger impact than money in someone’s pocket. You are showing that you support the work or service they offer. You are creating jobs and developing a more diverse and unique community in the place you call home. You are purchasing a story, a future conversation, and an appreciation for craftsmanship that can’t be found at a click of a button in a digital shopping cart. Bring a friend, make a day of it, or even, a weekend. Doors open to the 12th annual Missoula Holiday MADE fair on Sunday, December 9th at the Adams Center. Shop all three levels (arena floor, balcony, and upper gyms) of the curated collection of over 220 artisans 11am-6pm. There are additional savings during the Happy Hours the last 2 hours of the show, 4-6pm. Free entry and family friendly. Please consider bringing a non-perishable food item to donate to the Missoula Food Bank. It is important to buy local; not only for the holidays but year-round. Visit local farmer and artist markets, small shops, and art centers when you are in your own town or traveling. Surround yourself with and purchase gifts that tell a story and have a life of their own before making their way into your world. We are waiting for you and would love to tell you our story. Carol Lynn Lapotka is the handMADE Montana & MADE Fair founder. This Sustainable Missoula column is brought to you – via the Missoula Current – every Friday by Climate Smart Missoula and Home ReSource. December 7. First Friday Downtown. Build community and shop local. Partake is art walks, gatherings and parties a plenty.